Three teenagers were found guilty on Tuesday for a bomb attack at a Sikh Temple in Essen last year that injured three people. Prosecutors had argued that the three 17-year-olds - who were 16 at the time of the act - had attacked the temple out of radical Islamist motivations to kill “non-believers”. The youth court on Tuesday agreed that their motive had been hate for other religions. The trial uncovered no evidence of the three having direct contact with terror group Isis. Two of the three adolescents had set off the bomb in front of the entrance to the temple in April of last year, and were thus found guilty of attempted murder. One of the two was sentenced to seven years in youth detention, while the other received a sentence of six years and nine months. The third was found guilty of conspiring to murder for participating in the planning and preparation of the attack, and was sentenced to six years in youth detention. 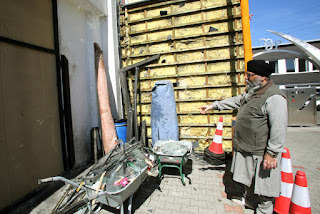 The trio’s homemade bomb exploded last April at a temple belonging to the Sikh Gurdwara Nanaksar congregation, injuring three people, including one Sikh priest seriously.